TSK is a way of growing without falling into a stagnant orientation. TSK challenges any and all limits on knowing and being. So it explores all persistent and habitual experiential structures that condition and prejudice experience—including rigid hierarchy, and unquestionable beliefs, attitudes, and authority. TSK examines the varying qualities of time, space, and knowledge in experience, as well as the sense of self often central to experience. TSK doesn’t presume there is a path we need to follow. If a certain state seems lacking, we can challenge the validity of this perspective, and more closely examine what seemed to be lacking rather than looking away and imagining a more complete or fulfilling condition in a different time or space. Offers a way of inquiry that does not depend on maintaining assumptions and beliefs. Makes any subject under analysis directly available, pointing out, perhaps more closely than has been done before, what is at stake and how to proceed. Follows no model or doctrine. All knowledge can be a part of the vision. Can encourage and inspire developments in every discipline and every field of knowledge. Offers a visionary medium through which common ground can be found in the pursuits of knowledge carried out by the various sciences and religions. Can unify fields of learning that are now separate, and bring together concerns that now seem opposed, such as the practical and the spiritual. Develops a flexible, broad-based appreciative capacity that can fulfill and unify all of humanity. A 20-minute prerecorded webinar introduction to TSK is available on demand. You can find the links to the three-part webinar at "Webinar Introduction to TSK." 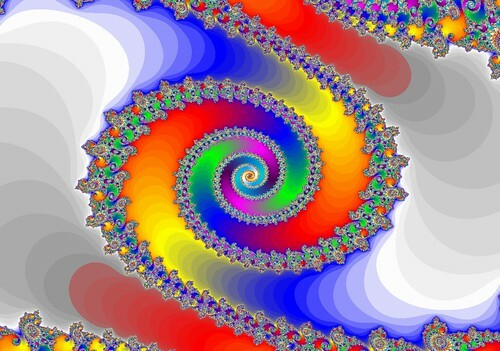 On our video page, there's a link to a fractal zoom movie with ten minutes of really beautiful color and patterns. The continual zooming in can challenge one's perception of size. "The Time, Space, and Knowledge (TSK) vision first emerged into the world in 1977,with the publication of Time, Space, and Knowledge: A New Vision of Reality. That work was the occasion for great excitement. It seemed to its first readers that something new had been brought into the world. . . . years later, the promise of TSK is as rich as ever. The vision has proved challenging; more challenging, perhaps, than those first entranced readers might have imagined." We've re-started our newsletter, and renamed it "The Field Communiqué." Subscribe here. The TSK Association is now offering an onsite or computer-based workshop on Mastering linear time. An application of TSK to psychology has been published: "Discovering the Zone" is a direct, nonsectarian, transpersonal approach to peak performance. This new therapy based on time, space, and knowledge involves radically new premises about methodology as well as different views of the human being. We can easily make use of web conference software that enables people to communicate via the Internet. Please let us know your ideas for either online or onsite workshops, classes, presentations, practice sessions, study groups, etc., on the form on the Programs page. We have published some exercises not included in the TSK books, movie-narrations of instructions of some exercises to make it very simple to 'get into' them, as well as exercise blogs where people can share their experiences of the exercises and learn from each other. The TSKA-created Generating Results community group in FaceBook inquires about how to approach peak performance at work. For more information, go to the Applications / Business page. There's a link to the movie Chronos, an amazing, speechless display of time, space, and light. Join a community of TSK fans from around the world! Free Membership -- Sign up! This nine-minute video, produced by Dr. Steve Randall, is hosted on YouTube at Got Time? It depicts the habitual Western problems with time pressure and the feeling of not having enough time, identifies common ways of not dealing with the problem, and then suggests that there are ways to change our personal time (like a personal space). Effective resources, including a free article, a free introductory workshop, and a workshop on Mastering Linear Time, are now available. See Introduction to Mastering Linear Time. In an effort to kickstart a 'time movement' to eliminate destructive time stress in Western cultures and evolve toward the zone of peak performance, the TSK Association is now offering an onsite or computer-based workshop that can be completed on your own, at your own rate, in the convenience of your home or office. For information on this workshop, Mastering Linear Time, click here. A free 48-minute movie introducing the workshop is being offered. Sign up using the form on this page: Introduction to Mastering Linear Time. For an article outlining an effective path to mastery of time pressures--based on seminars taught over twenty years with thousands of people--click here: Beat the Clock Before You Run Out of Time. A very important example of psychological time for Westerners is called linear time, a habitual and limiting perception of time flowing horizontally, like a conveyor belt, from past to present to future 'rooms' in our experience, at the same unchangeable speed for all of us. In the linear view, time flows like a conveyor belt that moves horizontally from past to present to future at the same unchangeable speed for all of us. (See Edward T. Hall, The Dance of Life (New York: Doubleday, 1983), pp. 78-9.) Time feels out of our control; we may feel some helplessness, and think we can only adapt to this 'reality'. For information on an onsite, or computer-based workshop on Mastering linear time, click here. Most of us are so used to linear time that it can be difficult to recognize. The following short exercise may help you identify linear time, as well as demonstrate how your perspective on time gets 'set up' within a moment. Click on the audio player below, listen to the phrases being read, and attend to your experience of time. Do you see how past, present, and future quickly get set up in your experience when the phrases are heard?